With Readly you can read All About History - Book of Christianity and thousands of other magazines on your tablet and smartphone. Get access to all with just one subscription. New releases and back issues – all included. "The story of Christianity is arguably history’s most extraordinary – the journey of an esoteric cult of personality to become the world’s biggest religion, with over two billion followers across the globe. From its humble beginnings, shrouded in myth and mystery, to its rise to imperial status, the All About History Book of Christianity tells a story more than 2,000 years in the making. Covering the myriad crusades, schisms, movements and individuals that have made Christianity what it is today, this is a must-read for curious enthusiasts and history buffs alike. Discover how Christians went from being a minority group persecuted by the Roman state to becoming the official religion of the Roman Empire, gaining followers exponentially. Follow England’s King Richard the Lionheart on his quest to liberate the Holy Land and learn about the founding of the Knights Templar. Understand the roots of the Protestant Reformation and how it spread across Europe, changing Christianity forever. Find out how Christianity navigated the global conflicts of the 20th century, and how the worldwide faith plans to face the challenges of the 21st century. 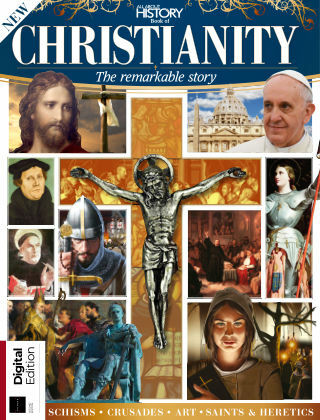 - Key events in Early Christianity - Constantine I, the Christian soldier - Rome becomes a Christian state - The canonisation of the Bible - Go and make disciples - The church that Jesus founded - The other church of Jesus - The Great Schism - Crusading to liberate the Holy Land - Richard the Lionheart's crusade - The betrayal of the Knights Templar - Three popes and a Western Schism - 10 most important popes - Joan of Arc - Famous saints and martyrs - The Spanish Inquisition - Isabella of Castile's Spanish Inquisition - Conquest in the New World - Burn the witch - Controversies in Christianity - The birth of the Reformation - Timeline of the Reformation - Henry VIII versus the church - The King James Bible - Christianity in the Age of Enlightenment - The Salem Witch Trials - Reshaping religion in British America - Mormonism and the Latter Day Saints - Christianity in the 20th century"